James Barber brings you the Alfred Dunhill commemorative Battle of Waterloo pipe and with it a piece of history. The pipe tamper presented with the pipe is of historic importance. The Cascabel (knob) and Breech of the cannon tampers are made from pig iron that was recast from an original French 12-pounder cannon ball from the Waterloo battle field which was purchased by Dunhill. The pipe and tamper are impressive enough alone but as youd expect from Dunhill they have really pushed the boat out with exquisite presentation. 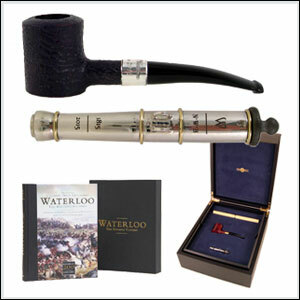 The Battle of Waterloo pipe is an elegant Quaint shape in size group 4. This shape has been specially made for this edition and has never been produced by Dunhill before. The pipes have semi-bevel rims and are fitted with precious metal bands engraved with the inscription The Battle of Waterloo and 1815 - 2015. The pipe tamper is shaped as a cannon of the period, with its main body cast from solid Sterling Silver. What gives those pipe tampers indeed historic importance is that the Cascabel (knob) and Breech of the cannon tampers are made from pig iron that was recast from an original French 12-pounder cannon ball from the Waterloo battle field. The deformed cannon ball was found buried into the Waterloo battle field ground in 1979 by a French metal detectorist and as subsequently purchased by the director of Alfred Dunhills White Spot division in 2012 in anticipation of this project. 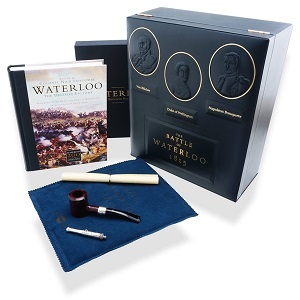 The highly collectable Battle of Waterloo editions are housed in a prestigious midnight blue leather box of generous dimensions. The lid bears the relief busts of the three generals Feldmarschall von Blücher, the Duke of Wellington and Napoléon Bonaparte. The pipe, the tamper and the certificate are presented in a removable tray.